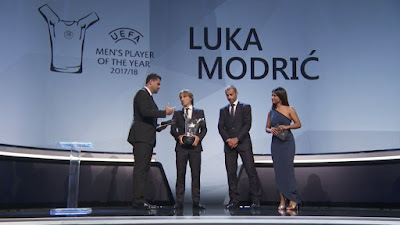 Real Madrid midfielder, Luka Modric has been named UEFA Men's Player of the Season, beating out Cristiano Ronaldo and Mohamed Salah to win the gong. The Croatian superstar who had a stellar year for his club and country, was also named Midfielder of the Season for the second successive year at a ceremony which took place in Monaco this afternoon. Real Madrid star, Sergio Ramos was voted as the competition's best defender last season, while his teammate, Keylor Navas was named as the best goalkeeper of last season's Champions League with Real Madrid.